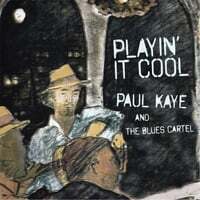 "Playin' It Cool", the debut album from Paul Kaye & The Blues Cartel, is a contemporary presentation of the Blues with a nod to the past and a focus on the future. Paul Kaye, a native New Yorker, arrived in Chicago in 1989 with the intention of mastering the Chicago blues. Up to that point he was primarily focused on an East Coast/Piedmont tradition of acoustic blues. Starting in the Chicago subways, by 2012 Paul was a headline act at the Chicago Blues Fest. In 2005, Paul formed The Blues Cartel to focus on his electric blues style that he had been evolving over the years as a veteran sideman. As a band leader he was able to develop his vision for creating a modern, 21st century style firmly rooted in the tradition that he has spent a lifetime mastering. The result is “Playin’ It Cool” recorded in Chicago and released in May 2016. As well as featuring Paul Kaye’s dynamic guitar playing and vocals, he is joined by Grammy winning drummer Kenny “Beedy Eyes” Smith and Grammy nominated bass player Harlan Terson. Over the years Paul has played with and been featured on recordings of: Honeyboy Edwards, Buddy Guy, Devil In A Wood Pile, David Myers, Harmonica Hinds, Louis Myers, Detroit Jr. and Bill Sims Jr. among many others.